I was supposed to drive to Philly this afternoon for the Occupy national gathering, but alas, my car broke down in southern Rhode Island, and now I’m back in Providence. Not just in Providence, but at a bar in Providence. And not just any bar, but the Duck & Bunny — the somewhat peculiar bar around the corner, where it’s perfectly acceptable to sit at the counter and read a book or type on your laptop. I’ve been sitting here the last hour and a half reading more of Ernesto Laclau’s nearly impenetrable Emancipation(s). I find it challenging to finish books once I’m pretty sure I’ve already grasped the main ideas — especially when each page feels like I’m climbing twenty flights of stairs when the author could have built an elevator (i.e. explained their ideas in a broadly accessible way). Nonetheless, I’ve become a big fan of Laclau and his Gramscian schema for hegemonic struggle. Oh no, I’m doing it too: “…Gramscian schema for hegemonic struggle!” I believe that making these ideas accessible to more people — particularly to the most active emerging young leaders involved in contemporary social change movements — is important. So, I suppose I’ll take a crack at it now. 1. leadership or predominant influence exercised by one nation over others, as in a confederation. My definition is more specific than the second, but less nation-specific than the first. I would say that hegemony is leadership or predominant influence exercised by one particular group / social aggregation over in relation to others. It could be on a between-nation level, as in the first definition, but it could also be on an intra-national or even local or regional level too — as in different particular local groups/identities vying for hegemonic influence within national politics, or local or regional spaces. For social justice-oriented challenger movements, a question emerges: Isn’t hegemony precisely what we’re fighting against? Some have argued affirmatively that, yes, hegemony itself is something that the conscientious should oppose. Many more, while not arguing this explicitly, have inferred an inherently negative meaning by only using the term to refer to oppressive regimes. At this point in the discussion, I find it helpful to introduce the concept of commonsense. Whomever has defined the prevailing commonsense has equally defined the hegemonic narrative, i.e. has won—even if only temporarily—the hegemonic contest over meanings in the culture. Are we against the achievement of such a feat? Well, do you want the values of compassion and solidarity, for example, to be universally embraced? Do you want tangible expressions of these values to be popular? Do you want trespasses against these values to be widely regarded as deviance from a norm? Or would you rather throw your particular values (of compassion and solidarity) into a sea of equally valid particulars (after all, who are we to judge particulars?) — a sea that includes values of bigotry and xenophobia, for example? Is there a contest here between different values and interpretations of reality? If so, do you want to win that contest? That is, do you want the values that you regard as socially beneficial to win out against the ones that you regard as socially destructive? If you win this struggle over meanings and narratives—i.e. if your values gain cultural hegemony and become the prevailing commonsense—the next step is to extend the hegemonic contest beyond symbols, narratives, and meanings, and to move into the terrain of institutions, policies, and consolidation (i.e. to give political “legs” to your moral victories). I’d say that the car trouble was definitely worth this post. Stunningly clear and useful. Your ideas are about as deep as that grain silo! (what does that mean?) Miss you. Pingback: Anatomy of populist hegemonic alignment (part 1) « Devoke the Apocalypse. 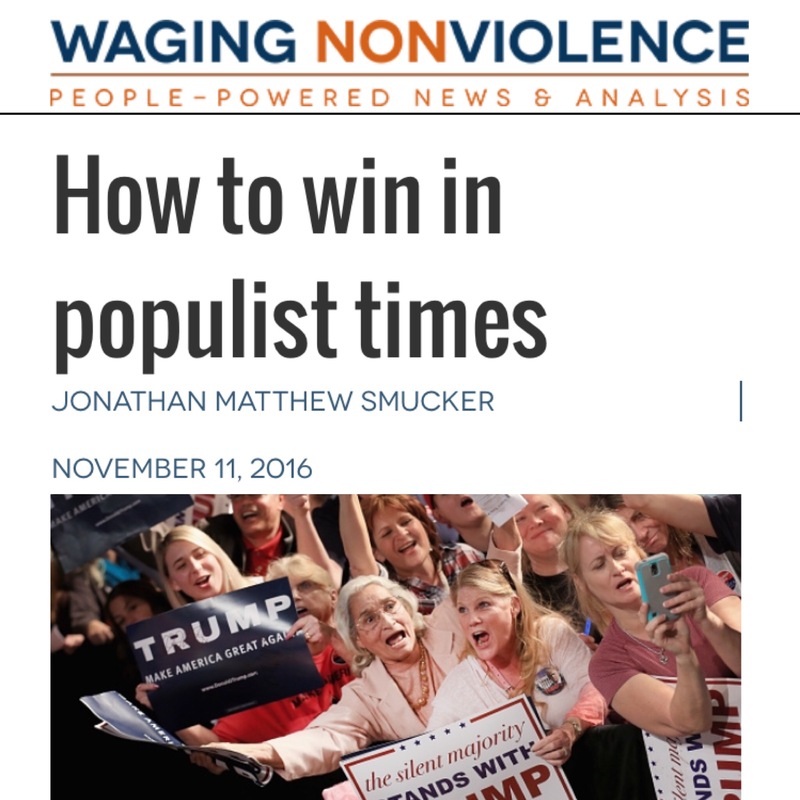 Pingback: Yes, populism « Devoke the Apocalypse. Pingback: more notes on ‘prefigurative politics’ | Devoke the Apocalypse. Pingback: The moral imperative of strategies of universalization (Bourdieu series #1) | Devoke the Apocalypse.